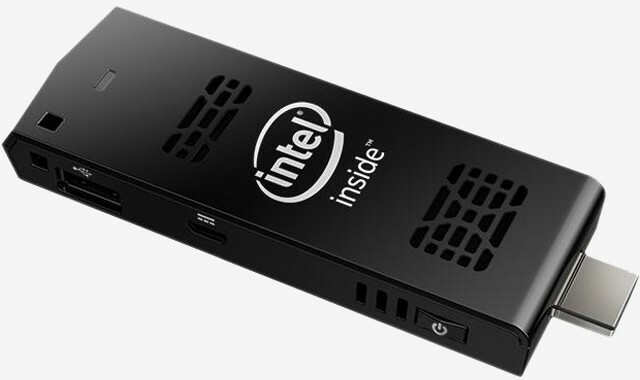 Intel’s Compute Stick, the impossibly small computer crammed inside an HDMI dongle, is now available for pre-order running your choice of Windows 8.1 or Linux (Ubuntu 14.04). In case you somehow missed it, the Compute Stick from Intel made its debut at CES this past January. It’s powered by a quad-core Intel Atom (Bay Trail) processor alongside 2GB of RAM and 32GB of internal storage. It also includes 802.11 b/g/n Wi-Fi, a full-sized USB port and Bluetooth 4.0 connectivity to make it easy to use with a keyboard and mouse. The device connects directly to a television or monitor via the HDMI connection; power is supplied through a micro USB connection. The stick PC is available for pre-order through both Amazon and Newegg. At the latter, the Windows-based system carries a price tag of $149.99 while the Linux version can be had for just $109.99. Astute readers may remember that Intel originally said the Linux dongle would retail for just $89. That price point was to be for a watered down model with just 1GB of RAM and 8GB of internal storage. It seems as though Intel may have decided against releasing this slower model as both the Windows and Linux versions currently up for pre-order feature 2GB of RAM and 32GB of internal storage. It’s entirely possible that Newegg may simply have the Linux specs wrong as other retailers are listing the slower model.